Intents describe potential future events which have not been agreed to by other agents. Intents are often used for discovering another agent to participate in a desired event. On the process side, for example, planned work could be an Intent, but planned work that some agent committed to is a Commitment. Commitments describe potential future events which the involved agents already agreed to pursue. Commitments can be considered contractual promises from one agent to another. Commitments are "mirrors" of economic events, and Economic Events can fulfull Commitments. Commitments can satisfy Intents. Economic Events describes past events, something observed, never some potential future event. They can fulfill Commitments or satisfy Intents (when there is no Commitment). 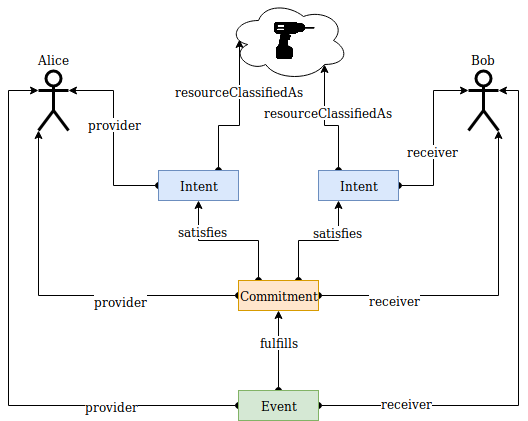 Claims resemble commitments, but are initiated by the receiver, not the provider. An economic event can trigger a reciprocal claim. Claims do not have to be instantiated, often they can be implied from an economic event and an agreement. Figure below shows that Economic Events have to be observed and for that reason only appear as records of the past. Future plans get represented with Intents and Commitments. Often agents will start their plans independently and record their initial intents. Later once they make a Commitment with other agent, it will represent a specific shared part of their plans. For that reason any Commitment can result in Satisfaction of providing agent&apos;s Intent as well as Satisfaction of receiving agent Intent. Intents, Commitments, and Economic Events can occur at any granularity that is needed or for which data can be obtained. So they primarily are used for all operational needs, but can also be used at higher levels for analytical and high level planning needs for communities or regions, for example. 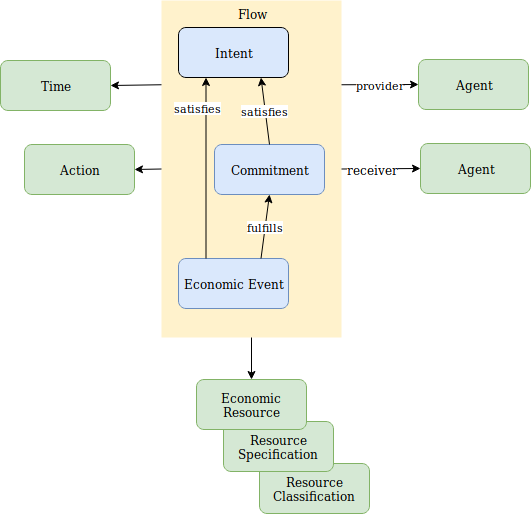 All flows use an action property to designate what the flow is doing and how it will affect an economic resource (or not). Actions are defined as follows. We have defined a core set of actions, but expect that this will be extended with others. If extended, they should be defined as part of this or another formal vocabulary so that all can use them and assume the same meaning. Temporary note: The actions use and work are time-based actions, either with or without an explicit schedule. How to handle time-based resources is still under discussion.